When I had my recent TIA incident, I was put on blood thinners that require me to be tested regularly to measure my levels. 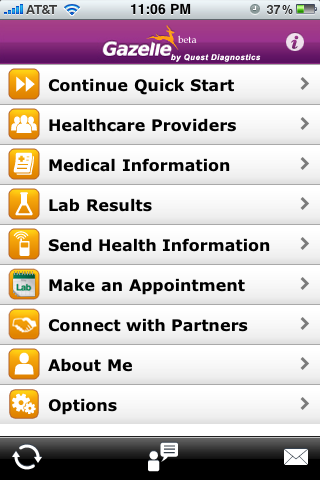 To get a record of my labs, I went out looking for a lab results app (specifically one for Quest Diagnostics) and I saw a mention of a new app they had called Gazelle (Why? Got me). I figured I would try it out. 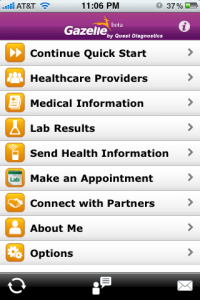 Much of this information is saved so that it can be accessed by anyone (such as EMTs and the like), although they would need to know you have the app. Other information is locked behind a password system, though I’m not entirely sure what use it would be without the password, except for one key thing – the most important factor for getting this app, which is that it would allow me to get (and store) my lab results. 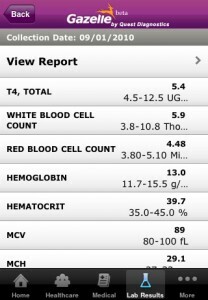 This is accomplished through the “Lab Results” section via two different steps. 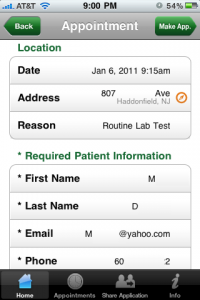 First, you have to request the lab results by entering the date and requesting physician, which sends a request to the lab to have the results posted to your account. It takes 2-3 days, but once the results are available you receive an email notification, and when you log back in, you see the results of your tests, as well as a history of previous tests. Entering your information is a multi-step process with form fields NOT formatted to gracefully accept inputs from a mobile device (such as dates, numbers, etc.). But it serves its purpose. Getting your lab results is fine, and the information is handy to have for physician visits. I have only been getting a single type of test result, but theoretically different types would have different displays and information. I don’t understand why a mobile app only gives you e-mail based notifications; there are no push-based notifications from the system. Toolbar – The toolbar has 3 icons: Home, Share App and Share Information – but none are labeled to let you know what they are. Clicking either of the latter two results in you being taken to an email client (which also logs you out of your account). 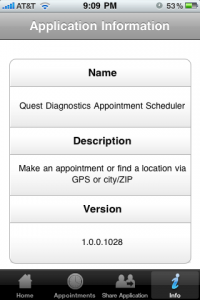 Make an Appointment – Strangely, this link takes you to a website to download a completely different application (Quest Appointment Scheduler). It would make more sense to have this incorporated into the application, in my mind. Overall, this app is nice but has some serious UX issues that need to be fixed in order to make it more useful. 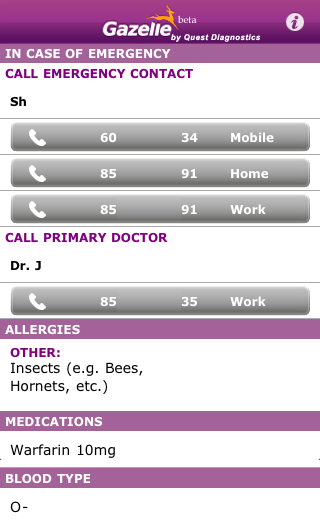 It’s a free app, so it’s simple to get for your iPhone or Blackberry models, and soon for Android. So, since I have to go to several appointments, that sent me to looking for a way to schedule my appointments so that I could avoid the long waits at the lab. 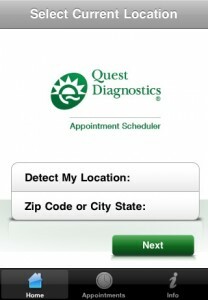 This second app has that more singular purpose – to make appointments at Quest Diagnostics’ offices. If you’ve ever been to Quest (or any other lab, I think), you know that having an appointment can cut a significant amount of time off of your visit (sometimes over an hour). While many people can’t really take advantage of this, as they usually don’t have time to make an appointment beforehand, people in my situation find it valuable. Upon loading the application, you select to search for a local Quest Diagnostics lab via geo-location or Zip Code, City or State. Step 2 involves selecting what type of testing you need done, such as routine labs, glucose tolerance, pediatric testing, drug screening or ‘blueprint for wellness’. 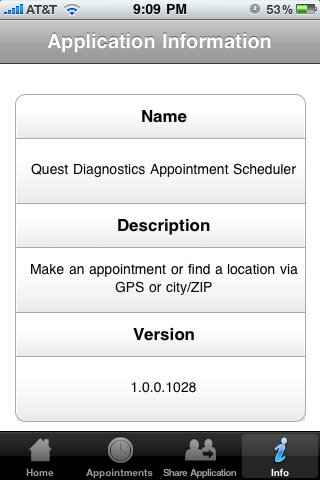 After selecting one, you can choose “Find location” or “Make an appointment”, although they are basically two paths to the same end result. If you choose “Find Location”, a map comes up with pins for all nearby locations, although it’s hard to select them easily. 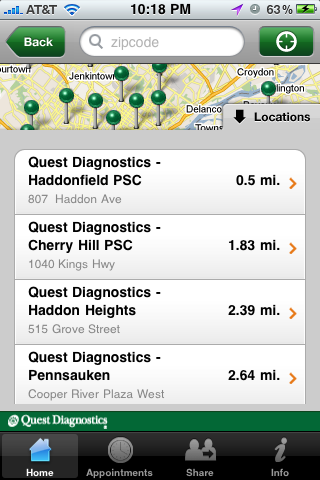 A list of locations can be opened via the menu, which is much easier. Next, a calendar comes up where you select the location and time you want to make the appointment. The interface of this is a bit confusing – there is a way to bring up a more standard calendar (by clicking the date) but it’s not evident, and clicking the arrows is slow as it checks each date for availability. 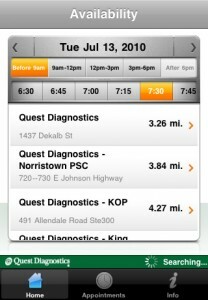 You then select the location (unless you did that first) and it takes you to the appointment details screen. 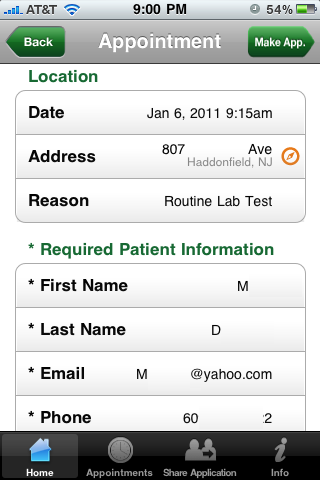 Once you make your appointment, you see a confirmation screen. However, if you need to make another appointment it takes you back to the beginning of the process – and remembers nothing you did before, a huge failing for someone who needs to make several appointments at once (admittedly a fringe case, but something that should be easy enough to do). Strangely, the online version of the process does the same thing – maddening. Also, there’s an option in the toolbar for “Appointments”, but that only shows your appointments for the current session – once you leave the app, the appointments disappear (and half the time, even the in-session save doesn’t seem to work). This is likely because this app has no login, so they can’t protect privacy but that is another reason that integrating this functionality into the Gazelle app makes more sense. Similarly, the app doesn’t save the appointment to any calendars, including your iPhone or Google calendar. There are two other toolbar options that have little value to the user. One is the ability to share the app with friends, which I doubt many people would do. The last is information about the app, but little of it is of use to the user. While this app has some utility, its limited functionality means that most people will quickly remove it after one use. With the addition of some minor functionality – such as saving your previous location while making a second appointment, or actually having information appear in your “Appointments” list, it could be more valuable. I went out to see if other companies have similar apps. 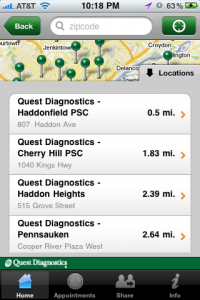 The biggest competitor for Quest Diagnostics is LabCorp doesn’t seem to have a consumer-based app, although they do have a Lab Test Results app for physicians (as does Quest Diagnostics). I couldn’t find any other similar apps. This entry was posted on Friday, December 31st, 2010 at 3:35 am	and is filed under Mobile, UX. You can follow any responses to this entry through the RSS 2.0 feed. You can leave a response, or trackback from your own site.